Columbia Missouri's Premier Full Service Hotel Our guests enjoy first class accommodations in the heart of Missouri and are only minutes away from local business including Shelter Insurance, State Farm, as well as University of Missouri, the VA and Boone Hospitals. You'll find downtown Columbia, the MU Campus, Mizzou Arena, Columbia College and various leisure destinations including Cosmo Park just a short drive away. 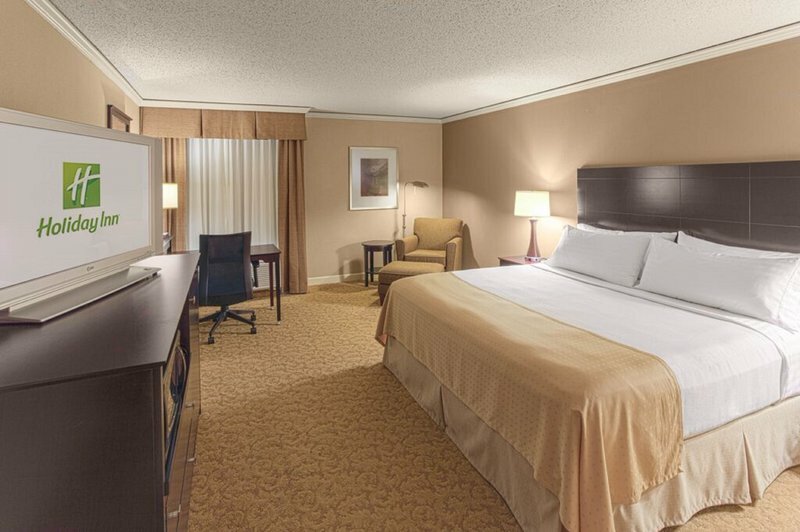 The Holiday Inn® Executive Center-Columbia Mall is conveniently located off I-70 at Stadium Boulevard and the Columbia Mall is across the street and within walking distance to additional dining options. Take advantage of upgraded accommodations by booking a Suite or an Exec Level room with amenities that include breakfast and drink vouchers as well as access to our Executive Lounge (Sunday through Thursday evenings). In addition, the hotel provides complimentary Wi-Fi, a 24-hr Business Center, indoor and outdoor (seasonal) pools, two restaurants/bars, our Atrium Lounge with a player piano, and a 3,000 sq. ft. state-of-the-art gym. Plus, we're pet friendly! Need to book a conference or event? The Holiday Inn Executive Center is the ideal location to handle meetings and events for up to 2500 people with more than 36,000 sq. ft. of flexible meeting and trade show space including the Columbia Expo Center. Call us today to book your stay in Columbia, MO. Atrium Lounge: The Atrium Lounge, located in the heart of the hotel, provides a comfortable environment as the sounds from the player piano provide an inviting atmosphere to unwind and enjoy a refreshing drink. Childrens's program - Enjoy the easy access to Cosmo Park which is just across the interstate. This 533 acre park features soccer fields, tennis courts, skate park, Rainbow Softball Complex, walking trails, 2 large childrens playgrounds, 7 shelters, and LA Nickel golf course. Windsor Ballroom: Providing a plush, versatile environment for banquets, receptions or large meetings, the elegant Windsor Ballroom can accommodate over 1,200 attendees, which makes it the ideal setting for your formal and refined event. LA NickellL. A. Nickell Golf Course is situated on a 533-acre park. The course presents an adequate challenge for the lower handicappers, while offering a fun and more difficult layout with generous ball landing areas for the higher handicappers and beginners. A.L. Gustin University Golf CourseGustin Golf Course has 18 holes of golf, a clubhouse, a putting green, and a driving range. The facility is open to the public, but its main mission is to serve the students, faculty, staff, and alumni of the University of Missouri. Perche Creek Golf ClubThe 18 hole par-3 golf course at Perche Creek offers a very unique way to practice, learn and develop your game. From beginners to the accomplished player, the Par-3 course is enjoyable for all. On pleasant evenings the front 9 is lit for night play. Eagle Knoll Golf CourseEagle Knoll is a par 72 public golf course that sits on 180 acres of picturesque terrain. This classic Ozark style course was designed by renowned architect Gary Kern and features rolling zoyzia fairways and sloping bent grass greens.